The California Assessment of Student Performance and Progress (CAASPP) System was established on January 1, 2014. The CAASPP System replaced the Standardized Testing and Report (STAR) Program, which became inoperative on July 1, 2013. The CAASPP System is intended to provide parents, teachers, administrators and students with accurate and actionable information about what students are learning. The CAASPP System encompasses the following assessments and student participation requirements. Information about the content and format of each test is also provided. Smarter Balanced Summative Assessments (SBAC) for English language arts/literacy (ELA) and mathematics in grades three through eight and grade eleven. Students who participate in the alternate assessments. ELA only—English learners who are in their first 12 months of attending a school in the United States. Content and Format: The Smarter Balanced Summative Assessments, which are delivered by computer, consist of two sections: a computer adaptive test and a performance task (PT) based on the Common Core State Standards (CCSS) for ELA and mathematics. The computer adaptive section includes a range of item types, such as selected response, constructed response, table, fill-in, graphing, and so forth. The PTs are extended activities that measure a student’s ability to integrate knowledge and skills across multiple standards—a key component of college and career readiness. Click on CAASPP Resources for Parents for more resources including Parent Guides to the CAASPP assessments. This site includes translations of the parent guides in Arabic, Chinese, Korean, Tagalog, Spanish, and Vietnamese, as well as links to summaries and videos in English and Spanish to aid in understanding Student Score Reports. Additional information in English and Spanish is available on the "What Parents and Students Should Know" page of the Smarter Balanced Assessment Consortium website. The Smarter Balanced Practice Tests, including scoring guides, are now available for grades 3 through 8 and grade 11 in English-language arts (ELA) and mathematics. The Practice Tests provide a preview of the Smarter Balanced assessments, but do not reflect the full range of content that students may encounter on the actual assessments. Click here for a Link to Online Practice and Training Tests for the SBAC. California Science Test (CAST) Test in grades five, eight, and once in high school. Student Participation: The CAST is required for all students in grades five and eight and once in high school (i.e., grade ten, eleven, or twelve) unless their IEP indicates assessment with an alternate test. The CAST includes stand-alone or discrete items and Performance Tasks (PTs). The discrete item types consist of selected response, constructed response, table, fill-in, graphing, and so forth. The PTs measure a student’s ability to integrate knowledge and skills across multiple standards through extended activities. Content and Format: The CAST is aligned with the California Next Generation Science Standards (CA NGSS). The State Board of Education adopted the CA NGSS in September 2013. The 2017 administration of the CAST was a census pilot test, the 2018 CAST was a census field test, and the 2019 CAST will be the first operational administration of the test. California Alternate Assessments (CAAs) for ELA and mathematics in grades three through eight and grade eleven. Student Participation: Students with the most significant cognitive disabilities who are unable to take the Smarter Balanced Summative Assessments even with accessibility supports and whose individualized education program (IEP) indicates assessment with an alternate test. Content and Format: The content of the alternate assessment is based on alternate achievement standards derived from the CCSS for students with the most significant cognitive disabilities. The CAAs are computer-based two-stage adaptive tests. They are administered to students in a one-on-one environment by a test examiner who is familiar with the student. For more information click here for A Parent Guide to Understanding the California Alternate Assessments. Click here for additional translations in Arabic, Chinese, Korean, Tagalog, Spanish, or Vietnamese. California Alternate Assessment [CAA] for Science Pilot Test in grades five, eight, and once in high school. Student Participation: The CAA for Science is required for students with the most significant cognitive disabilities who are unable to take the CAST even with accessibility supports and whose IEP indicates assessment with an alternate test. The CAA for Science is administered to students in grades five and eight and once in high school (i.e., grade ten, eleven, or twelve). Content and Format: The content of the alternate assessment is based on alternate achievement standards derived from the CA NGSS. The CAA for Science is administered to students in a one-on-one environment by a test examiner who is familiar with the student. In 2017, pilot year one the CAA for Science consisted of one embedded Performance Test (PT); pilot year two, in 2018, consisted of three embedded PTs; and in 2019, the CAA for Science field test will consist of three embedded PTs administered online. The CAA for Science embedded PTs may be administered anytime during the school's spring instructional calendar. Pupils in applicable grade levels will participate in the California Assessment of Student Performance and Progress (CAASPP) except as exempted by law. Each year, a parent may submit a written request to excuse his or her child from any or all parts of the CAASPP assessments for that school year. If the parent submits the exemption request after testing begins, any test(s) completed before the request is submitted will be scored; the results will be included in the pupil’s records and reported to the parent. School district employees will not solicit or encourage any exemption request on behalf of a pupil or group of pupils. This information can also be found on page 10 of the 2018-19 PUSD Parent and Student Guide. Who will take these computer-based assessments? Students in grades 3- 8 and 11 will use computers and/or chromebooks to take the state assessments in English language arts and mathematics. 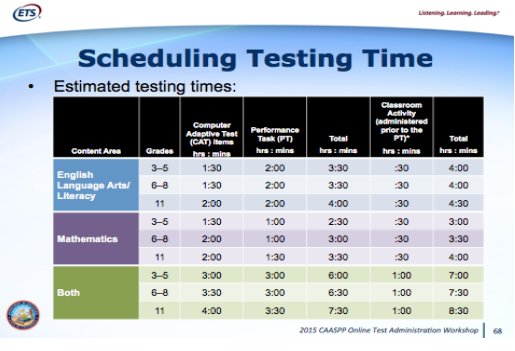 What is the estimated time for each test? What is a Computer Adaptive Test (CAT) component on the online summative assessment? The computer adaptive portion of the online test includes a wide variety of item types. As students progress throughout a CAT, the computer program adjusts the difficulty of questions throughout the assessment based on their responses. For example, a student who answers a question correctly will receive a more challenging item, while an incorrect answer generates an easier question. What is a Performance Task (PT) component on the online summative assessment? The PT is designed to provide students with an opportunity to demonstrate their ability to apply their knowledge and higher order thinking skills to explore and analyze a complex, real world scenario. Prior to the PT, teachers or instructional staff conduct a Classroom Activity for all students to ensure that a lack of understanding of the context of the task does not interfere with a student’s ability to address the content of the task. What types of questions will be on the online summative assessment? Computer testing with these types of response options are new for many students.